← Do you know what I’m doing? Nobody figured out exactly what I was doing in the photograph shown in the previous post (does anybody now see the whirligig beetles in the lower left corner of the photo? ), but I sure enjoyed the guesses. Several people alluded to dropping the camera or falling into the water, while others mentioned my heretofore unrevealed contortionist abilities. However, Morgan Jackson‘s tale of trying to photograph Platypsyllus castoris has it all – rarely photographed species and the inordinate lengths we go through to get the shot. 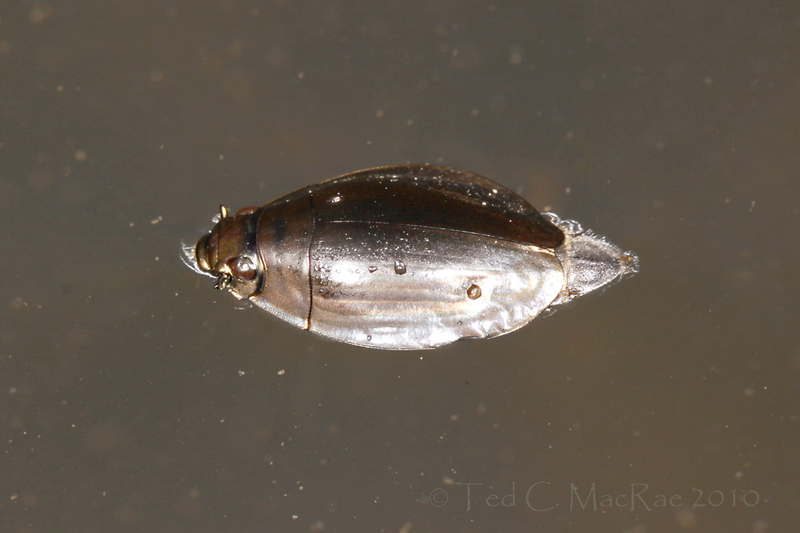 Of course, whirligig beetles (family Gyrinidae) are much more commonly encountered than Platypsyllus castoris, but they can’t be any easier to photograph. I spotted them as Rich and I balanced our way across a massive sycamore tree trunk while crossing the Black River during our early April hike of the lower Wappapello Section of the Ozark Trail. I don’t know much more about whirligig beetles (or aquatic insects in general) than your average land-lubbin’ entomologist (in fact, I don’t think I’ve collected any since college systematics – yes, that long ago! ), but for some reason I felt the need to try to photograph them. Sure, the fallen tree provided a rare opportunity to get reasonably close to these very skittish insects without having to wade, but I think it was actually just the challenge of trying to photograph something in constant zigzagging motion that appealed to me. Rich’s warnings that I would drop my camera were not enough to dissuade me, and after reaching the other side I ditched the backpack and tiptoed out with just my camera. It’s far from a perfect photo – I had to adjust the levels because I hadn’t figured out the best lighting to use for something on the water’s surface, and the specular highlights from the flash on the forward elytron are rather extreme. But the entire beetle is in focus, and we can make a reasonable guess as to its identity. 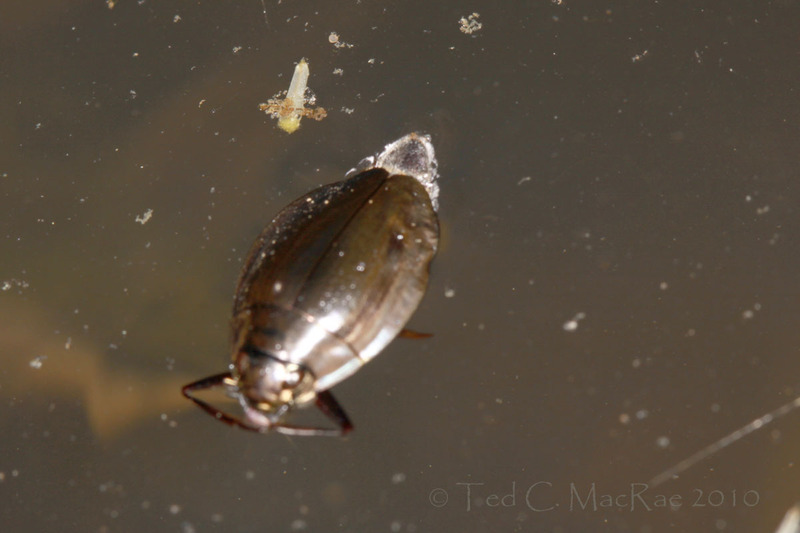 There are only two genera of whirligig beetles in Missouri – Dineutus and Gyrinus – and the large size (~12 mm in length) and hidden scutellum clearly identify this individual as something in the former genus. Moreover, the rounded elytral apices (seen on other individuals as well) narrow it down even further to just a few possible species. Unfortunately, they are distinguished primarily by ventral coloration; however, the bad first photo clearly does show dark legs, suggesting this may be D. ciliatus and not the orange-legged D. emarginatus. I don’t even really care what species it is (did you ever think you’d hear me say that? ), I’m just happy to have gotten a reasonably good photograph of an insect that surely few people have photographed well. This entry was posted in Coleoptera, Gyrinidae and tagged beetles, entomology, insects, Missouri, nature, Ozark Trail, science, techniques, whirligig beetles. Bookmark the permalink. I think, at least in this case, that it really was more about the challenge than the insect itself. I’ve not yet dared to try to photograph whirligigs up close – you got a great shot at the end! Sometimes I do see them hanging out on my pond rather still, barely moving, in the mornings… perhaps sometime I’ll try to sneak up on them. Thanks, WBL. Early morning – that’s a good idea. Maybe not quite as cool as a beaver parasite, but great shots either way! Patience paid off in the end! Difficult enough under controlled conditions, but almost impossible in the field. I’m sure I would have taken a dip! Rich was sure I was gonna do the dip, too. I probably wouldn’t have even thought to try if they were in a more accessible place. And here I thought you were looking for your contact lens. But I couldn’t agree more about the difficulty of photographing these guys. Most of my attempts look like the first photo, only much worse. Same here – I just didn’t quit until got the one that I could show. I’ve been collecting beetles all morning. I’m sure this is where I put the beer so it would be cold. Sorry to comment on an older post like this, but I’ve been perusing your posts and was delighted to find a this one on my favorite group, the Gyrinidae. First of all, don’t forget about the third genus from Missouri: Gyretes. Babin and Alarie (2004) officially reported the genus from Missouri. When I surveyed the gyrinids of Arkansas for my M.S. thesis umpteen years ago, I got Gyretes from 64 of the 75 counties. I have no doubt it is common in Missouri as well. As for your pictures, Dineutus ciliatus (Forsberg) is the identity. If you look at the first picture, you can see the vitta on the beetle’s left side. D. ciliatus is the only North American species with vittae. I’m enjoying the blog and your great photos and looking forward to more of the same. Hi Brady – comments on old posts are always welcome, especially when they contain added info to supplement that in the post. I did not know about Gyretes, so now you’ve given me the hankering to go out and find it. Thanks for the species ID – good to know I was on the right track.